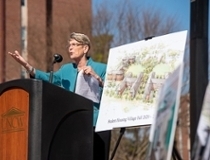 A groundbreaking held Thursday on the campus of UNCW marks the beginning of an investment of $147 million into student housing. Two buildings are scheduled for completion in the fall of 2020 and the two remaining buildings in the fall of 2021. The addition of 1,800 new beds for residential students is a priority outlined in the university’s Strategic Plan. More than 16,700 students currently attend UNCW, and the university is positioning its programs and services to help the university grow strategically for years to come, said Sartarelli. Planning for the student housing village began two years ago. The damage caused by Hurricane Florence resulted in the closure of some campus housing, making this new space even more critical. University officials will work with design and construction partners to develop buildings prepared to weather future storms. Pat Leonard, vice chancellor for student affairs, said the university is about to embark on a plan to continue transforming student life on the UNCW campus. “This is yet another great day in the history of UNC Wilmington,” she added. The Student Housing Village will have more than 430,000 square feet of space, including a success center where students will find academic, advising and career assistance; two classrooms and two makerspaces; dining venues on a vibrant market-like street and a connecting path that will guide students to Chancellor’s Walk and the academic heart of campus. “As impressive as the project’s facts are, the buildings’ true value will be measured by the transformative impact they will have on our campus and many future generations of Seahawks,” said Peter Groenendyk, director of Housing and Residence Life. 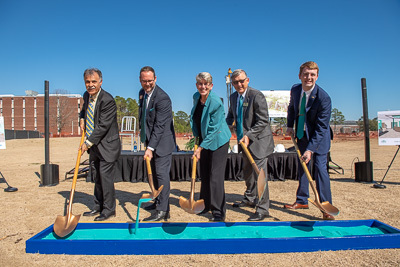 (l to r) Chancellor Jose V. Sartarelli; Peter Groenendyk, Director of Housing and Residence Life; Pat Leonard, Vice Chancellor for Student Affairs; Ronald B. McNeill, UNCW Board of Trustees Chair; and Cole Tillett, Student Body President participate in a ceremonial groundbreaking on the site of the new Student Housing Village. Pat Leonard, Vice Chancellor for Student Affairs, addresses the crowd.